I was recently contacted by the lovely from Bayard Books asking if I would be interested in reviewing some children’s books for him. I love to read and I have two little boys who love looking at books and being read too. So my answer was yes. I was definetly not dissapointed, these are great. Colourful, imaginative and keep their attention for long than a few seconds. If you haven’t heard of Bayard before, they produce three monthly books for children – StoryBox (3-6 year olds), AdventureBox (6-9 year olds) and DiscoveryBox (9-12 year olds). They are jam-packed with exciting stories, characters, games and activities and can be enjoyed on their own and as a teaching aid. Winners of Parent’s choice Gold Awards too. 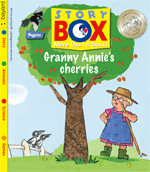 Story Box – My 3yo and I loved this book, the story was great, but the best thing about was that the story contained magpies. What’s good about that I hear you say? Well, magpies are something you see in your garden or around your house everyday, so it meant we could read the story and then look for magpies. Also it told you all about magpies, what they like, where the live, etc. I can’t praise this book enough, made a rainy afternoon bearable. 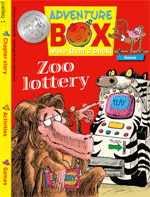 Adventure Box – This book is a little too old for my little ones, but it didn’t stop us enjoying it. I read this book to my 3yo each night and within 3 nights we were at the end of the story. He really enjoyed it and loved pointing out the monkeys. I did the games at the back with him. Discovery Box – My two little ones are far too young for this book, but I found it great. It’s a wealth of information about all kinds of animals in danger. I will be keeping this for the furture to show my boys. I did show them all the pictues, the loved the pandas. Fantastic for older kids and adults alike. Also on the Discovery Box Magazine there is a wonderful competition for a tiger adoption, in partnership with the WWF. For more info you can visit them at http://www.wwf.org.uk/ please help to protect our beautiful planet.